Delivering More Lighting Profile Options - First Light Technologies Ltd.
With a mission of pushing the potential of solar lighting, we’re always looking for ways to further improve the flexibility and reliability of our products. That’s why we’re excited to deliver real-time lighting profiles. Traditionally, solar lights have been programmed to turn on, dim or turn off based on a set amount of time relative to sunset or sunrise. For example, the default lighting profile for the IPL architectural area light turns the fixture on at dusk, dims the light to 30% after 5 hours, brightens back to 100% one hour before dawn and then turns off at dawn. But with the time of sunset and sunrise changing throughout the year, one functionality that our customers have been asking for is the ability to program lights to turn off or dim based on real time rather than a time relative to sunset. Now, customers can set a specific time (event time) between 6:00pm and 6:00am for when they want their light to dim or turn off (for example, 11:00 pm). This can be set at the factory through your product order or you can adjust the time through First Light’s iOS app for applicable lights. The motion sensor feature can be set to activate the light when needed through the rest of the night. This feature is now available for all new orders of SCL2 area lights at no extra cost and will soon be available for all new First Light luminaires. Real-time lighting profiles allow our customers to meet dark sky, municipally or HOA mandated lighting ordinances whether they require lower light levels or lights to be turned off altogether at a certain time. This capability is also ideal for organizations that need lights to automatically turn off after a facility is closed. With light pollution being a huge challenge that has negative impacts on human health and wildlife, you want to ensure you have ample light when users need it and minimize it when it’s not being used. That’s why in addition to programmable, time-based lighting profiles to optimize the time that lights are on, our fixtures are also optically designed to efficiently put light where it is needed and minimize where it’s not (backlight, uplight and glare). Our lights allow you to add light to increase safety in outdoor areas while also complying with Dark Sky Association’s model lighting ordinance. 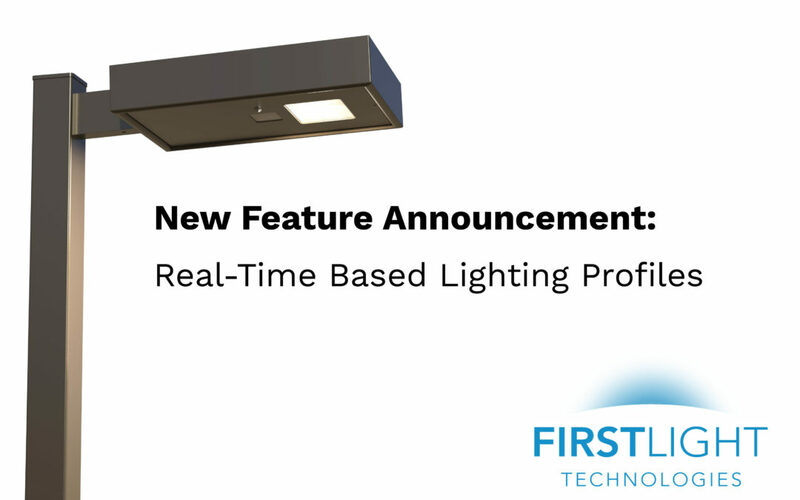 There is a new order key option for choosing a real-time based lighting profile. You can choose any time between 18:00 and 06:00 for your light to turn off or dim. After you receive and install your light, you will need to connect through our iOS app to set the time. Once you connect through the app, you can also adjust the profile event time, event action or opt for a pre-programmed lighting profile. If you want to learn more about our real-time lighting profile option or anything else related to pedestrian-scale outdoor lighting, please don’t hesitate to call us at 1 844 279-8754 or contact us.